Apparently, when it comes to wind, mother nature pays no mind to “reduced speed ahead” signs. 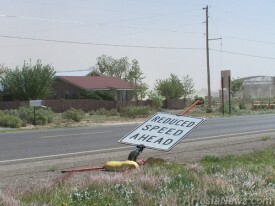 In a photo taken this morning west of Artesia on U.S. 82, a sign warning motorists to slow down bends toward the ground as winds blow into town at a high rate of speed. The high winds, with gusts up to 70 mph, are expected to continue throughout this evening and into Friday.